It's more than a year since Pebble announced its bold decision to open up the hardware of its smartwatches with its new Smartstraps platform. It even pledged $1m to help make the best accessory concepts, using the smart port on the back of the watch, a reality. When we caught up with Eric Migicovsky, Pebble's CEO, at CES at the start of the year, he hinted at slow and steady progress. "It's coming along," he said. "As I said six months ago, the idea is not that it's going to change overnight and everyone's going to start buying [Smartstraps]. Now, there's the chance to build on top of the hardware." Migicovsky has tried out, personally endorsed and even invested in some of the Smartstraps being made for Pebble. We've taken a closer look at the most exciting Smartstraps to see what you will be adding to your Pebble in 2016. Designed for fitness fans, the Pal claims to provide 24 hours of GPS tracking, which is right up there with running watches from the likes of Garmin and Polar in terms of longevity. That's thanks to the 250mAh battery, which is also built into the strap, which will power your Pebble for an extra seven days on top of the already superb battery life. When it comes to workouts, the strap uses its own companion app. That means you can control workouts on the Pebble watch itself, but then review data on pace, speed, lap time and altitude. There's also the usual array of charts and graphs, as well Google Maps integration for showing off the route of your run. "We are truly excited to support Powerstrap and the development of their Pal smart strap because GPS and extra battery life are the kinds of features that our community has always wanted," said Pebble's founder Eric Migicovsky. Powerstrap's completed its successful Kickstarter campaign and is now working towards meeting an October 2016 shipping date for its running and cycling-friendly $79 Pebble smartstrap. We first heard about FitPay's NFC contactless payment Smartstrap back in November 2015. The Pagaré strap, for the Pebble Time series, successfully raised enough money on Kickstarter to bring it to life and now it's available for pre-order. The Smartstrap, which connects to Visa's and MasterCard's networks the same way that Apple Pay does, is available for $69 and is expected to ship before the end of 2016. FitPay is also selling bundles with Pebble Time watches. FitPay has done a couple of really nifty things. There's the ability to enter your PIN onto the Pebble watch so you can leave your phone at home. The secure element is on the backplate but the NFC antenna is actually embedded onto the strap so it's closer to the actual terminal making it less awkward to use. There's an embedded USB port in the band itself, too, so you can ditch the proprietary cable. "We took the opportunity to develop a strap that would leverage that smart port interface and leverage the Pebble community," FitPay's CEO and co-founder Michael Orlando told us. 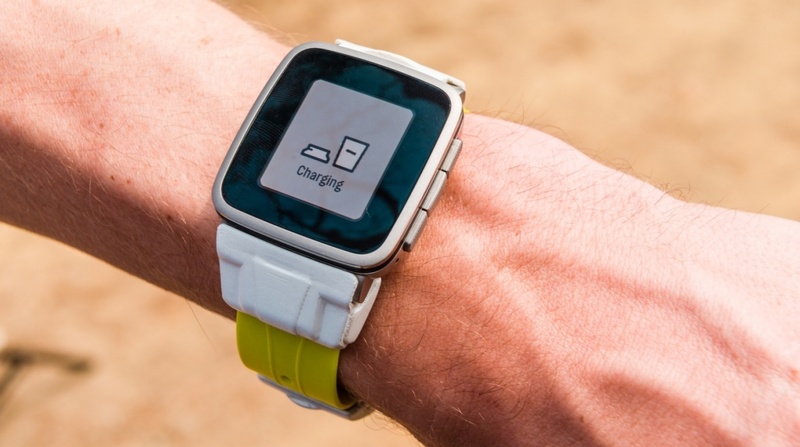 "Pebble is really excited about us giving its users a new way to charge too." Did FitPay receive any of Pebble's $1m pledge after it participated in the Pebble Rocks Boulder hackathon with 74 other teams last October? "We haven't yet, they do have that fund," said Orlando. "I think their intention as we've discussed it, is really to support the programs, as in those devices which are going to make it to market. So supporting a Kickstarter campaign like ours and providing some other funds to move us along. I think they are waiting to see the commercial viability of those. They have provided a tremendous of support in terms of endorsement, marketing and PR." Look out for more news from FitPay in 2016. It raised $3.1 million in investment and Orlando revealed that it is working with other wearable tech manufacturers to bring contactless payments to smartwatches, fitness bands and smart jewellery by fall 2016. Deus Ex Technology's Aria Smartstrap raised $166,075 from 1,756 backers last July. Technically the campaign was for two products - a Pebble Time Smartstrap and a smart Clip, aimed at Android Wear watch wearers. Both allow the wearer to control their smartwatch, smartphone or other devices via gestures like opening your hand, clicking fingers or pressing an index finger to your thumb. Four out of five Kickstarter pledges and pre-orders so far have been for the Pebble accessory and Deus Ex has received money from Pebble's Smartstraps fund as well as angel investors in London and the Hax accelerator program in Shenzhen. "I met Eric Migicovsky in Beijing when I still had a very raw prototype," Deus Ex founder Alfredo Belfiori told us. "I didn't have the idea initially to create a strap. We were more focused on the Clip that was more universal, no matter which smartwatch. But Eric asked us very specifically to do something for the Pebble and he gave us money during the Kickstarter campaign." Here's how it works - our fingers are pulled and flexed by muscles on the forearm, connected by tendons. Aria uses tendon analysis algorithms to track motion sensing without tracking muscle activity with electrical sensors. For certain gestures, it's possible to find a pattern in the force and movement of each tendon connected to the finger. The Smartstrap can track up to 20 personalised gestures but Deus Ex recommends choosing four or five because you probably won't be able to remember more than that. "The goal is matching the accuracy of the machine and the accuracy of the human," he said. "That's the job of the artificial intelligence inside the device. We have to track very accurately but on the other side, we have to understand and that's the core value inside the hardware." Right now, Belfiori is working on making the second gen device more comfortable for different wrist sizes and users are beta testing the Clip pre-production units. Belfiori is starting an 18 month project with Imperial College London, where he studied biomedical engineering, to evaluate the use of his sensors for use in rehabilitation assessment of motor impaired patients. A clinical study next year will aim to see how much the tech can improve these patients' motor skills with the end goal being to build a wearable device. OK you got us, this is not technically a Smartstrap. But the TYLT VU Pulse is well worth a mention as it's a case for Pebble Time and Time Steel watches which adds an optical heart rate monitor and wireless charging capabilities, in return for a bit (4.4mm) of bulk. It smashed its original $100,000 Kickstarter target and also raised big bucks through an Indiegogo campaign as well. "We decided on a case because from an engineering perspective, it was the best way to remain integrated with accessory port and make it robust," TYLT's VP of product management told us. "Since we integrated Qi wireless charging, there is no need to remove the case/connector since it can be charged through the plastic. As an added bonus, you can still use the existing Pebble band or any other 22mm watchband with the case form factor." When we spoke to TYLT, McRae said that in this version, heart rate data is only displayed in the VU Pulse app on the Pebble watch. Now Pebble has announced that it has opened up its Health platform to third party apps and watch faces, we should see more integration - for instance, pulling this data into its main Health app. One Pebble Smartstrap has actually already starting shipping - Seeedstudio's Xadow modular strap aimed at hackers and makers. This Blocks-style accessory allows tinkerers to add GPS, NFC and heart rate modules to their Pebble watch and developers can write apps which talk to the main Xadow Main Board. Early feedback from backers have been that it's a neat idea but not so practical when you're actually wearing the thing. For instance, Pebble user Ian Mackereth posted in a Smartstraps thread on Pebble's forum: "As the first on the scene it is commendable but the designers have had to compromise in order to make it a kit. There are 4 modules and these effectively fill the length of the stap. Each module is 8mm deep which has the (obvious) effect of making the strap very bulky and not really useful for every day use." One of the first Pebble Smartstrap concepts to get some buzz, around the time of the $1m pledge announcement, was Spark.IO's concept which was designed to use its Electron IoT board to hack the Pebble Time and connect it directly to a mobile network. While it has already shipped, the Smartstrap concept remains just that, a concept designed to illustrate the kinds of products that makers could prototype with the development board which costs just $59 for the 3G version. Particle's VP of marketing, Stephanie Rich told us there are "no plans to pursue the Pebble Smartstrap idea right now." If any Pebble owners who received an Electron decide to take on the challenge, let us know how you get on in the comments. Another Smartstrap which hasn't had a smooth ride is Ripple, the accessory designed to bring solar charging to Pebble watches. In this case, it seems that the appetite for a renewable energy powered Pebble just isn't there yet. Ripple aimed to add 13 hours of battery life, via one hour of sunlight, to Pebbles but the fact is that the battery life is already pretty solid. Still, 696 backers did pledge $56,960 of the $80,000 that Gixia Group was hoping to raise on Kickstarter and the team posted the following update: "Even though it did not work out this time, we hope this campaign has raised awareness of the breakthrough solar power technology. Your backing of Ripple has also empowered us to create more renewable energy products. We hope we're able to reach out to you soon with a new plan." Have you seen any Pebble Smartstraps on crowdfunding platforms or up for pre-order that we've missed? Let us know in the comments.